With many fantastic locations across the country attracting gambling tourists nationwide, the US is also a popular international destination for gambling trips. This kind of tourism is a growing market. Many risk-takers and casino-goers are willing to travel to play and/or to stay in a casino resort complex on the other side of the globe just in order to enjoy that specific location. What makes the casino patrons, casino-goers and gamblers of all kinds choose this or that gambling trip destination and what are the features and peculiarities a gambling tourist might be looking for? Let’s take a closer look at the best gambling cities in the US and to what they offer to their guest. The very name of this city is a brand, closely associated with the gambling industry. And even more – Vagas carries a whiff of all kinds of adult entertainment, for which reason it is also called Sin City, one of the most visited tourist destinations. This city, also known as an informal gambling capital of the world, holds 131 casinos. Here a widest possible selection of games and services is offered. But the main offer of Las Vegas as a city is not gambling, casino-going, shopping, dining, entertainment, and nightlife. It is something else. They sell one very specific thing in Vegas. It is ‘Vegas atmosphere’ – this specific feeling of being in the world’s most important and biggest gambling hub. This feeling can make people happy just because of staying or even walking there, submerged in this wonderful, thrilling, risk-taking and wondrous atmosphere of hustle and bustle so typical for Vegas. Too many words can be said about Vegas, but we should admit that (rephrasing a well-known saying) talking about Vegas is like dancing about architecture. You should go and see Vegas yourself. See, or rather feel it. Just be ready to find it a bit too expensive, especially in high seasons. But Vegas is worth every dollar spent there. Reno is a small town in Northern Nevada, situated in the western part of the state at the foot of the Sierra Nevada Mountain Range. “The biggest little city in the world” – that is how some people call this place. It might seem strange as the city is quite big, its population is about 250,000 people – but this slogan dates back to 1929 when the town was only waiting for its chance to develop. And it finally happened due to gambling legalization in Nevada in 1931. It catapulted Reno to its current position of highly-developed gambling and hospitality hub, well-known across the USA and internationally. In fact, Reno was known to be the capital of the gambling industry in the US till the late 1950s when the upswing of Las Vegas overshadowed Reno’s positions. The development of native American Casino business in neighboring California also took its toll, but nevertheless, Reno with its 20 casinos still remains a noticeable attraction point for gamblers from San Francisco Bay Area and Sacramento. On top of that, there are many other tourist attractions in Reno: classic car show, balloon race, motorbike fan gathering etc. On top of that, the location is rather suitable for those who love mountains: gamblers or not, the tourists just love the Sierra Nevada very much. 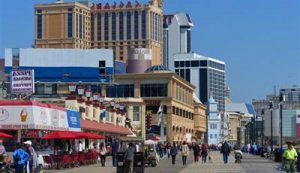 Atlantic City, sometimes called “America’s favorite playground,” is known for its 13 big and modern world-class casino-hotel complexes and cozy well-maintained beaches. The city’s skyline is also a big attraction. Everyone who had strolled the famed Boardwalk along the line of casino-hotel-resort facilities on one side and the ocean on the other would never forget it. Gambling in Atlantic City never stops: it is pulsing 24/7/365 (366 in a lip year) with thousands of games available. It is the second largest gambling city in the US and the largest one on the East Coast. This place is definitely worth visiting. New Orleans, known as the center of gambling in the 19th century, is still one of the most preferred gambling destinations in the world. It has a lot of gaming attractions. Riverboat casinos, cruising down the Mississippi River, attract many risk-takers. Indeed, it is just an exciting gambling adventure – to play various casino games while sailing up and down the great American river. New Orleans, a historic city that has preserved its old Louisiana atmosphere, is just a perfect tourist destination, which makes visiting it a very nice place to go for combined gambling and sightseeing purposes. If you want to see the newest gambling city, you should choose Palm Springs in California. It has developed into a small but rather modern gambling resort offering first-class casino gambling experience, including table and slot games. This desert resort city is one of the fastest developing tourist destinations. With its five huge hotel-casino complexes and some more to become operational in the near future, it is one of the most promising gambling locations in the US. The attractions also include hiking in the nearby mountains, golf, horseback riding, and active cultural life. 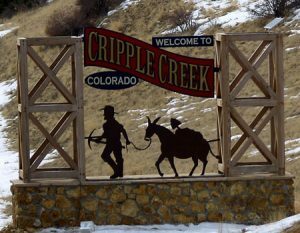 In case you prefer a western-style ambiance for gambling, then Cripple Creek, Colorado, will be one of your favorites. It was thoroughly restored to take you back to the gold rush era when it was an important gold-mining camp. But it is not a ghost town – life is in full swing here, maybe even in an upswing since 1991 when Colorado voters approved legalized gambling. The unique urban atmosphere of the past is well maintained in the gambling venues in Cripple Creek. There are 12 high-class and stylish casinos in the town to offer you about 3,800 slots and casino games. The visitors also enjoy clean and slightly rarified air at 9,494 ft (2,894 m) elevation, and many tourist attractions like a narrow gauge train, real gold mine, and even an opera – a famous Butte Opera House staging plays, musicals, and melodramas. Everybody likes Miami. This place steals your heart forever. An unforgettable combination of natural and urban landscape, rich history and cultural life, and 74 modern and comfortable casinos to offer you more than 16,000 slots and casino games attract risk-takers and casino-goers both nationwide and internationally. Many gamblers you would see there are returning customers – Miami casinos and hotels are the places where you would love to come back one day.